For other uses, see Oden (disambiguation). Oden (おでん) is a type of nabemono (Japanese one-pot dishes), consisting of several ingredients such as boiled eggs, daikon, konjac, and processed fishcakes stewed in a light, soy-flavored dashi broth. (video) Various oden stewing in broth. Oden was originally what is now commonly called misodengaku or simply dengaku; konjac (konnyaku) or tofu was boiled and eaten with miso. 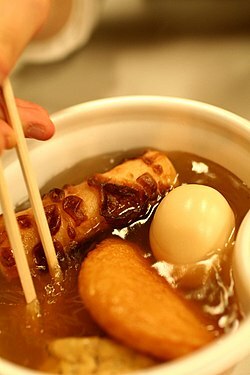 Later, instead of using miso, ingredients were cooked in dashi, and oden became popular. Ingredients vary according to region and between each household. Karashi is often used as a condiment. Oden is often sold from food carts, though some izakayas also serve it, and dedicated oden restaurants exist. Many different varieties are sold, with single-ingredient dishes sometimes as cheap as 100 yen. While it is usually considered a winter food, some carts and restaurants offer oden year-round. Many of these restaurants keep their broth as a master stock, replenishing it as it simmers to let the flavor deepen and develop over many months and years. In Nagoya, it may be called Kantō-ni (関東煮) and soy sauce is used as a dipping sauce. Miso oden is simmered in Hatchomiso broth, which tastes lightly sweet. Konjac and tofu are common ingredients. In the Kansai area, this dish is sometimes called Kanto-daki (関東煮 / 関東炊き) and tends to be more strongly flavored than the lighter Kantō version. Oden in Shizuoka uses a dark colored broth flavored with beef stock and dark soy sauce, and all ingredients are skewered. Dried and ground fish (sardine, mackerel, or katsuobushi) and aonori powder (edible seaweed) are sprinkled on top before eating. Udon restaurants in Kagawa Prefecture in Shikoku almost always offer oden as a side dish, to be eaten with sweet miso while waiting for udon. In China, 7-11 markets oden as haodun (好炖) a word play on "good pot." In South Korea, the loanword odeng (오뎅) borrowed from Japanese oden (おでん) is a synonym of eomuk (fishcakes). The boiled dish consist of fishcakes are called by the names such as odeng-tang (오뎅탕) or eomuk-jeongol (어묵전골), with the words such as tang (soup) or jeongol (hot pot) attached to the ingredient name. The street food version is sold from small carts and is usually served with a spicy soup. It is very common on the streets of South Korea and there are many restaurants that have it on the menu or specialize in it. The dish was introduced to Taiwanese cuisine during Japanese rule and is referred to in Taiwanese Hokkien as olen (Pe̍h-ōe-jī: o͘-lián), which has been further loaned into Taiwanese Mandarin as hēilún (Chinese: 黑輪). Tianbula (Chinese: 甜不辣; pinyin: tiánbùlà; literally: 'sweet, not spicy') is a similar dish commonly sold at night markets. Despite using the same name as the Japanese tempura, Taiwanese tempura is more a variant of oden. Besides the more traditional ingredients, the Taiwanese olen also uses many local ingredients, such as pork meatballs and blood puddings. More recently, oden is offered in convenience stores where it is sold as guāndōngzhǔ (關東煮, from Kansai kanto-daki). ^ Mishan, Ligaya (7 June 2018). "At Davelle, a Son of Hokkaido Puts Luxury in Reach". New York Times. Retrieved 22 September 2018. ^ 関西ではなぜおでんを「関東煮」と呼ぶのか？ [Why Oden is called "Kanto-daki" in Kansai?] (in Japanese). Nikkei Inc. February 2, 2013. Look up おでん in Wiktionary, the free dictionary. Wikimedia Commons has media related to Oden.